Before breakfast I found myself looking for a new hotel. Our hotel would have been ok had it been reasonably cool, but the heat wave, coupled with the fact that it had neither a/c or fans, made it unbearable. So, here I was, traipsing through town at about 6am. I found many possibilities – the fact that they hadn’t been mentioned in the guide books or on the web had meant I had missed them. 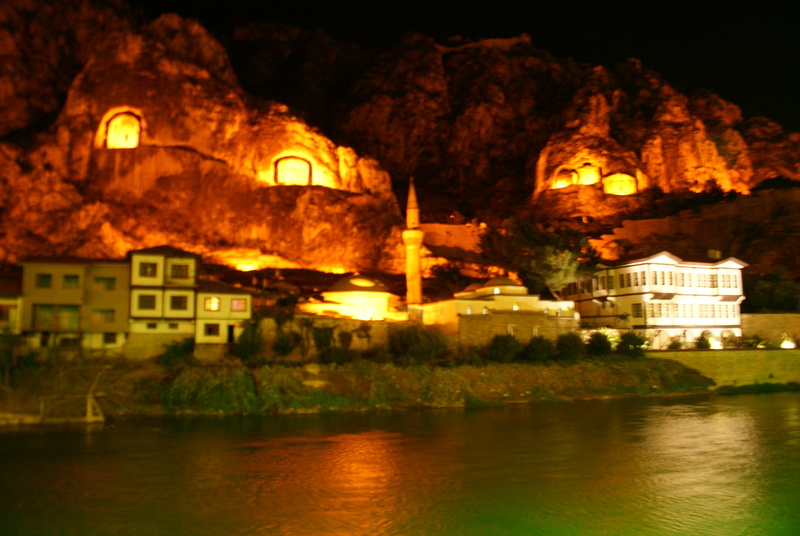 Amasya is not a huge tourist draw though it attracts adventurous backpackers- it’s off the beaten path and unless one is traveling the great Seljuk cities of Central Anatolia, one will miss it completely. Amasya is a town divided by a river – on one bank is the commercial heart of the city while on the opposite side is the old part of town, that has almost completely been renovated and many of the houses turned into boutique hotels. I found our new accommodation at the Emin Efendi Konaklari – a renovated old house with beautiful rooms – it was cheaper than the Ilk pansiyon, far nicer and had all important a/c. We dropped off our bags and set out to explore the town. 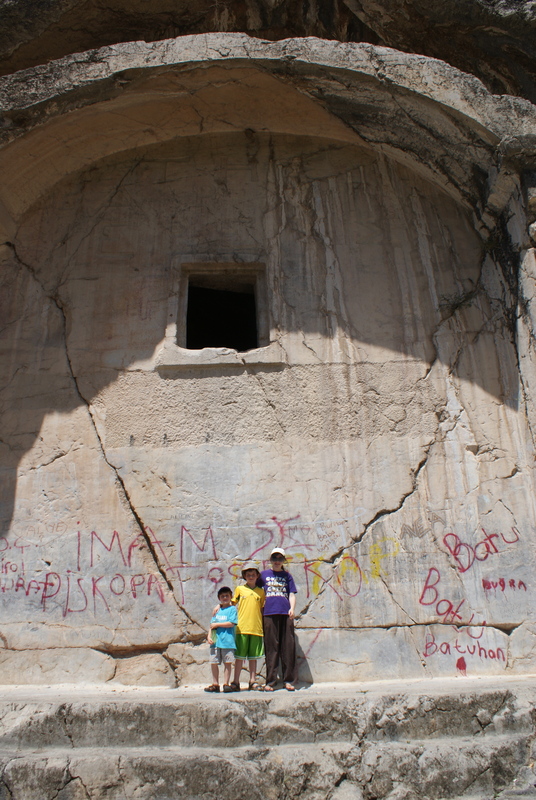 We wanted to see the ancient rock tombs that loom high above the city. We found a cab driver who said he’d take us and he insisted on using the taxi meter. Usually, I am all in favor of meters and so we said fine, but he started driving out of town and took us to a gas station to fill up. I was very suspicious – we were already at about $10 and here he was filling up – we’d basically paid for him to get to the gas station and we hadn’t seen a tomb yet. We got out, paid and left. I had seen another taxi rank around the corner, and I went straight there – asking for the same service and we agreed on $30 – steep but ok when compared with our first taxi, and this included all the tombs and the citadel and waiting time while we explored. He was happy and so was I. I was certain that if we’ d stayed with the first guy the bill would have been huge. The tombs themselves were interesting but there was very little in the way of explanation. They were also very difficult to explore. Essentially the rock had been cut out around the tomb, and a small hole way up the front led to a hollowed out chamber where the body had been placed. But it was too high to reach the chamber and so all we could do was walk around the back, which took just a few minutes at most. Many of the tombs didn’t even allow one to venture around the back as they were fenced in. This was turning out be a case of something that looked great from afar but which was less interesting from close up. The citadel was far more exciting. A huge castle wall high up on a hill overlooking the whole city with a massive Turkish flag on top. We left our taxi at the parking and started walking up. Only later did we realise we’d made a mistake in our route, which was precarious, along a small ledge, through a tunnel, up a rickety wooden ladder and eventually a scramble to the top. It was pretty scary though the boys loved it. Hilit and Gal stopped half way up. It was only when we reached the top and saw a group of elderly people did I realised that there must be another easier way up – and there was – a concrete set of stairs leading up from the back of the citadel – we had simply followed the wrong arrow at the entrance. The fact remained – the way we came up was a lot more fun (and no doubt dangerous and out of bounds as well). On the way down we saw an archeological dig in progress. The people there yelled at us and we thought they were inviting us to visit – we came a lot closer only to see clearly that they were telling us to stay away. This is what can happen without a common language! It was just as well that we had changed taxis and were on the “fixed rate” plan. Our driver had waited close to an hour for us while we climbed up and down the citadel. A running meter would have cost a fortune. After a rest back at the hotel, we explored the town at night. It was packed with families and we had perhaps our best ice cream ever at a very popular waterfront cafe. We did notice more foreigners in Amasya than we had on the Black Sea – the town gets good reviews in various guidebooks and it attracts backpackers. Afterwards, it was back to the comfort of our air-conditioned room. PS: These days I am planning great family trips to Turkey. Ckick here for more info. « Independent Family Travel – does prebooking hotels make sense? A very good guide book for traveler, especially when people visit Tokapi Palace. My favorite all-round guide books are the Rough Guides series – they really have a good sense of what is authentic and real, rather than just tourist stuff!